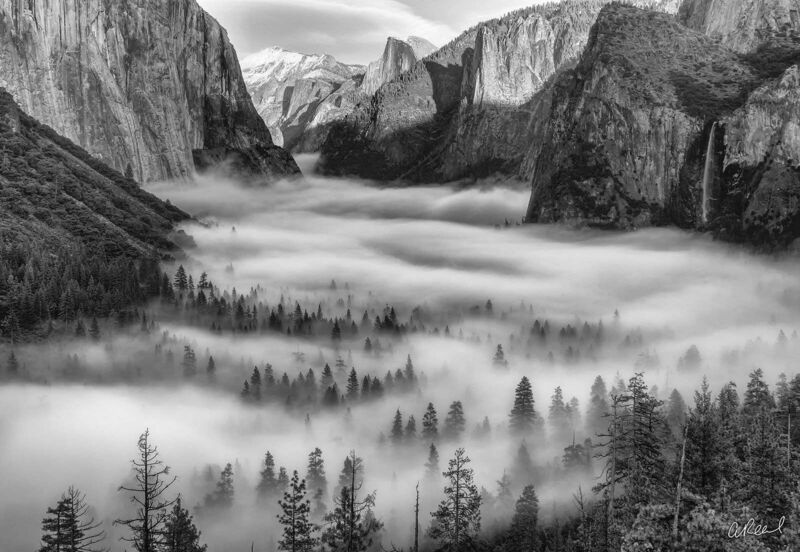 Fine Art Limited Edition of 100 - The geology of the Yosemite area is characterized by granitic rocks and remnants of older rock. About 10 million years ago, the Sierra Nevada was uplifted and then tilted to form its relatively gentle western slopes and the more dramatic eastern slopes. The uplift increased the steepness of stream and river beds, resulting in formation of deep, narrow canyons. About one million years ago, snow and ice accumulated, forming glaciers at the higher alpine meadows that moved down the river valleys. Ice thickness in Yosemite Valley may have reached 4,000 feet (1,200 m) during the early glacial episode. The downslope movement of the ice masses cut and sculpted the U-shaped valley that attracts so many visitors to its scenic vistas today. Photo © copyright by Aaron Reed.